It was an ugly sight. In the bottom of the third inning with the bases loaded and no outs in a tightly-contested contest with the reigning World Series champion San Francisco Giants, Milwaukee Brewers right fielder Ryan Braun stepped into the batter’s box with every intention of giving his club the lead with at the very least a base knock — something the 28-year-old former National League Most Valuable Player has accomplished a time or two during his tenure with the club. Problem was, that didn’t happen. Something else did. Swinging-and-missing is not something Braun has become known for during his career with Milwaukee, but that was exactly what happened Tuesday night. In total, Giants pitching induced eight swings-and-misses from Braun, his highest single-game total of the young season. But it was that bases-loaded, at-bat ending swing at a pitch nearly eye-level that was most disheartening for Braun in the series opener. I myself questioned its validity. Whatever the case may be, that swing was, as I said earlier, an ugly sight. Unfortunately, this has become somewhat of a norm for Braun this season. While it is probably too early yet to conclusively say whether or not Braun is witnessing a regression with respect to his plate discipline this season, the numbers are certainly there to support it. At first glance, it seems Braun is yet again off to a hot regular-season start — boasting a handsome yet not overwhelming .286/.375/.543 slash line with two home runs, eight runs batted in and a stolen base. He seems to be driving the ball to all fields and getting on base in ways he only knows how. That’s where the positives end and the negatives begin, however. With respect to the plate discipline I alluded to earlier, things have taken a wrong turn south this season for Braun. After Tuesday night’s contest — in which he went 0-for-5 with four strikeouts — the face of the franchise is has now struck out (15) in 37.5% of his plate appearances (40) this season compared to drawing just five walks, two of which were intentional. This is alarmingly high, notwithstanding the fact that he has played in just nine games this season. And it all starts with the fact that Braun is unprotected in Ron Roenicke’s current lineup. Since Aramis Ramirez was placed on the 15-day disabled list April 6, Braun has struggled at the plate considerably. In the six games since the injury, he has gone 6-for-27 (.222) with just three extra base hits. More important is the fact that Braun has struck out 12 times and walked just twice. In Ramirez’s absence, Rickie Weeks simply hasn’t provided Braun sufficient protection. In turn, Braun seems to be pressing to swing the bat at pitches he otherwise would not, despite the fact that he has actually seen less pitches in the strikezone this season compared to last. According to FanGraphs, Braun has seen just 42.7 percent his pitches be called for strikes, a career low, and down from 45.6 percent last season. These two facts do not bode well for Milwaukee, as sources have indicated that Ramirez will by no means be rushed back off the disabled list. It could be a decent amount of time before he returns to Roenicke’s roster at full health. Delving a bit deeper into the statistics, we find there is more reason for concern for Braun. 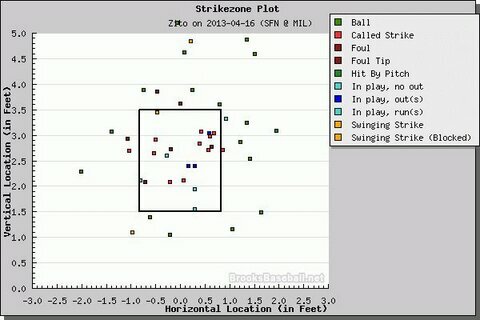 FanGraphs’ pitch F/X data says that Braun has struggled to contact pitches outside and inside the strikezone. The table above illustrates Braun’s early struggles. As you can see, Braun’s overall contact rate has dropped by over 10 points from last season — by far and away a career-low. His O-Contact rate (the percentage of times a batter makes contact with a pitch thrown outside the strike zone) has also dipped from where it was last season and his Z-Contact rate (contact on pitches in the strike zone) has also dropped, despite the fact that his overall swing rate remains where it was at last season. If Braun’s swing rate this season was considerably higher than last season, there would be an explanation for the lack of contact; more swings generally equals higher chance of contact or lack thereof. But since it remains the same as it was last season, there should be cause for concern. The yellow dot at the top of the chart is the pitch I alluded to earlier. From a pitch-by-pitch standpoint, we get a more specific look at where Braun has most struggled. His whiff rate on sliders this season is exactly 43.8 percent, up from just 16.3 percent last season. He’s put less four-seam fastballs in play (13.9%) this season than last (15.8%), despite the fact that they’ve been thrown for strikes at nearly the same rate (there’s only a 0.1% difference in strike frequency) and almost half (49%) of the pitches thrown against him have been fastballs, a pitch he customarily tees off on over the course of his career. Whatever the case may be, whatever the statistics tell us at this early juncture of the season, something is up with Braun. Going 0-for-5 with four strikeouts in one game is not player Brewers fans have come to know over the years. Yes, it was just one game and there will be plenty of opportunities to make up for it, but we can only judge what we see; and what we see is not good. A lack of contact in and out of the zone may be a product of Aramis Ramirez’s absence in the batting order, it may not be. We really have no solid way of knowing. What’s important is that this does not become the new norm for Braun. 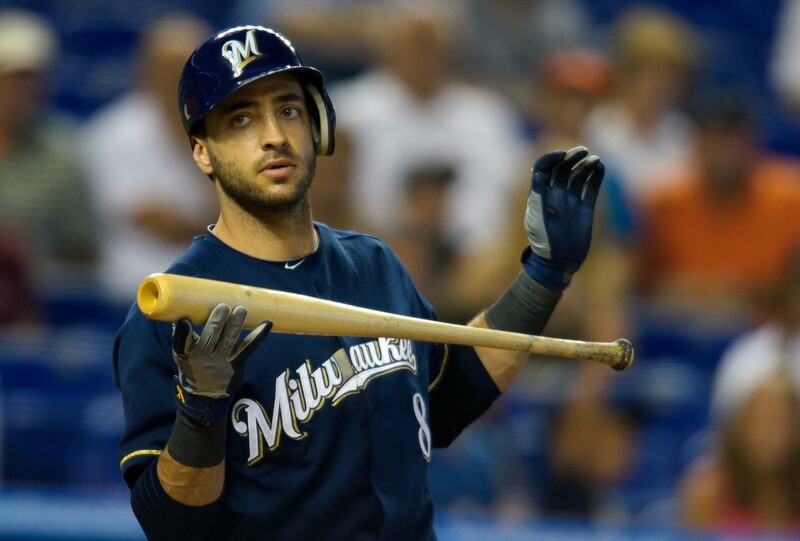 The fate of the Brewers’ 2013 season and subsequent seasons depend on it.